Alex Ley is excited to be part of something new. 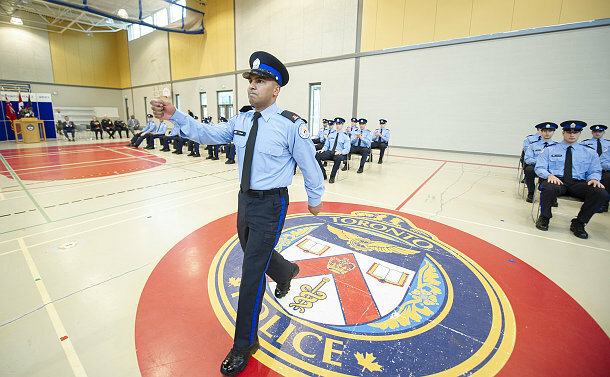 He’s among the second class of District Special Constables (DSC) that graduated on April 11 at the Toronto Police College. The position was created to supplement and help create capacity for frontline officers. “I feel like the early DSCs have an opportunity to shape the program and help influence the Service in how they deploy us,” said Ley, whose wife – Meaghan also works for the Service. They have a two-year-old daughter. Ley worked in civilian roles with the Service, including as a Parking Enforcement Officer for over three years and in construction before that. His ultimate goal is become a police officer. Ley’s father-in-law, retired D/Sgt. Steve Morse, presented him with his badge. Like Ley, Deanna Henley was a Parking Enforcement Officer. The DSC training lasted 12 weeks, including instruction on crime scene management and de-escalation techniques. Almost all of the DSCs have completed post-secondary education. The class of DSC consists of 26 current members and four external hires who have stepped forward to join and support the Service on the frontline. A total of 14 was hired last year. 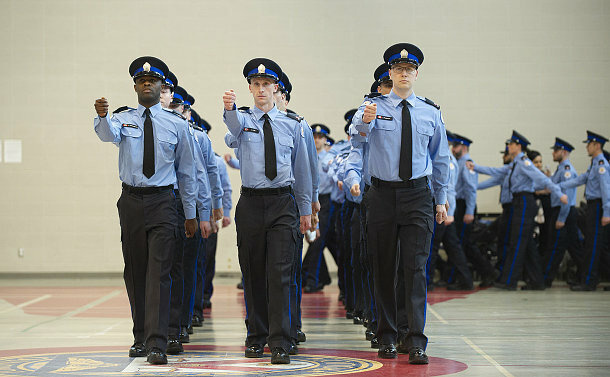 Deployed to Priority Response Command 51 and 14 Divisions, the recruits will support frontline members with booking and prisoner management, basic report taking, document service, crime scene security, canvassing, evidence & missing person searches, evidence collecting & processing, parking infractions and mental health & de-escalation. They will also assist community members with Crime Prevention Through Environmental Design (CPTED). In addition, they have been extended Mental Health Act Section 17 powers that enable them to take custody of a person apprehended by a police officer. A total of 30 Court Officers also graduated alongside the District Special Constables. “This is a dream come true for me and I am so happy to have my family here to share this special moment with me,” said Jose Buruca, a married father of seven children whose ages range from nine months to 12 years. He has been a Knights of Columbus youth counsellor for five years. Born in the United States and raised in Toronto, Buruca said the eight-week training program was intense. Of the 30 new Court Officers, 96 per cent have completed post-secondary education and 42 per cent speak languages other than English. They will be responsible for transporting over 400 prisoners who attend court daily in 272 courtrooms across the city. They will also ensure the safe management of about 60,000 citizens appearing in in-custody annually. In welcoming the DSC and Court Officers to the police family, Chief Mark Saunders reminded them they are peace officers. 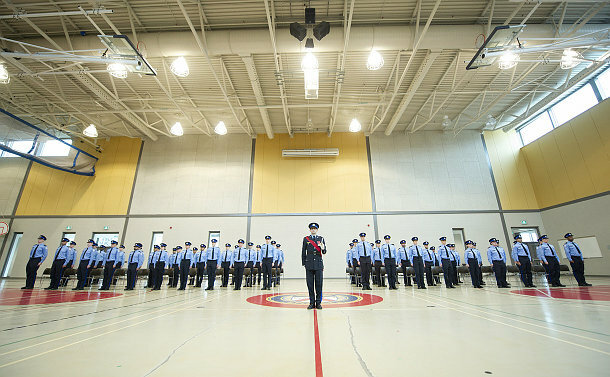 In order to be successful in their new roles, Saunders advised the recruits to adhere to their top-of-the-line training, use their moral compass to help people that need help and value the importance of people they come into contact with. 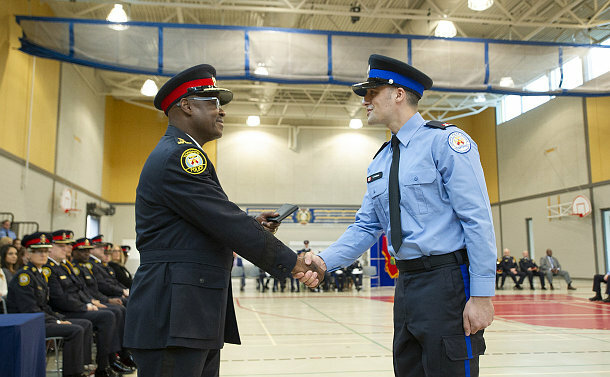 In his remarks, Toronto Police Services Board Executive Director Ryan Teschner told the graduates they are an integral and significant part of the organization. “You will play a vital role in the support of the ‘The Way Forward’ which is our comprehensive modernization and transformation plan,” he said. “We are lucky to have each one of you for your talent, skills, insights and connections… As Special Constables, you are now part of the continuum of community safety services that our organization delivers to residents and visitors in Toronto each and every day. Supt. Christopher Kirkpatrick, the College’s Unit Commander, thanked the graduates for their attention and determination. “You are part of the best police service in Canada and the world,” he said. Court Officer Clayton Hubble won the High Academic Achievement Award with a 97.7 per cent mark, DSC Naveed Zaidi was the recipient of the Physical Training Most Improved Award as voted by his peers, Court Officer Alexander Maj and DSC Devon Skeats were the Physical Training High Performance Award winners and DSC Angelo Franceschinis and Court Officer Jason Han were the Leadership Award recipients.